Fits most International 9100, 9200 and 9900 Series daycab conventionals manufactured after March 1997. 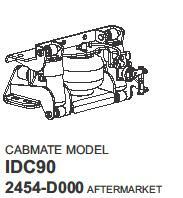 Also fits most International 9200 Series daycab conventionals with DDH manufactured before March 1997. Also fits most International 9400 and 9900 severe service daycab conventionals manufactured after December 2001 (manufactured before December 2001 require part number 2476-B000).